The ABC’s of Veils: From Birdcage to Cathedral, Which Veil is Right for You? You’ve found your dream wedding dress and now comes the fun part! Accessorizing not only compliments the final wedding day look, it also helps elevates your dress to the next level. If you thought that long veils would always win, think again! Do you remember what veil Kate Middleton, the Dutchess of Cambridge wore? Veils really bring a beautiful elegance and charm to your wedding dress and we’ve broken down some of the most common terms used in the wedding industry. A beautiful vintage option, the birdcage is typically short, just covering the eyes or extending down to the chin. It is typically made with a netting fabric and the face is more transparent. 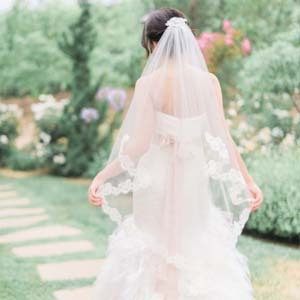 We tend to see this veil with classic Audrey Hepburn looking wedding dresses or beautiful vintage wedding dresses that remind us of the Great Gatsby time. The blusher has many names including Angle and Wedge veil. 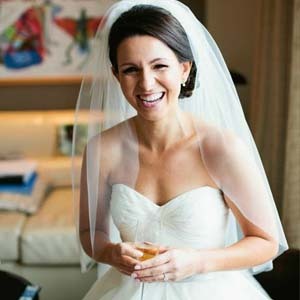 It is shorter and smaller variation of the birdcage veil that is often worn on an angle giving the bride a slight wedge over one eye. Soft and subtle this is another great choice if you wanted a smaller, less formal veil option for your wedding. This beautiful style is a longer veil that sits anywhere between the knee and the ankle. It displays the prettiness of a long and dramatic veil without any worry that you might trip over it. This is the kind of veil you can dance the night away in, hence the super cute name, get it? The most dramatic veil of them, the Cathedral is a photogenic beauty mostly worn for formal weddings. 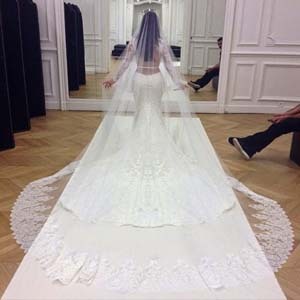 It is the longest veil in the veil family with a train that can range from gown length to church aisle length. Though not as dramatic as the Cathedral, the Chapel veil is a statement-making veil that sweeps the floor. This length may sometime have a slight train and it is also worn for formal weddings. This is a gorgeous option is you have a simpler dress or a soft wedding dress. 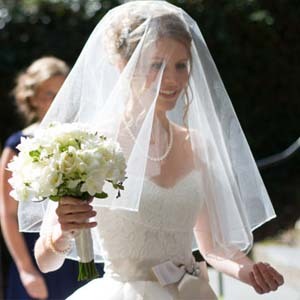 Elbow-length veils are among the easiest veils to manage. 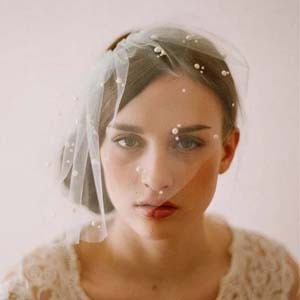 Short, sweet and to the point, these veils among the most commonly worn veils for many years. Some brides partner this style with a blusher for a tradition look that elegant and romantic. A stylish compromise of dramatic and easy to handle, the fingertip veil is flattering design that brings together multiple elements of shorter and longer veils. It is a popular choice among the modern bride as it is versatile enough to pair with a variety of gowns. Now that you've seen the most common veil lengths, guess which one Princess Kate wore? She wore a Fingertip Length Veil! It goes to show that even one of the most anticipated weddings in the world didn't have a long dramatic veil and the Dutchess of Cambridge selected one that truly complemented her dress. Hopefully these definitions help you navigate the world of veils and not to worry, if you still feel a little lost, our Ferre Bride consultants will be able to recommend a few during your fitting!